A word that will be used a lot to describe the new, live-action retelling of the 1991 Disney animated classic Beauty and the Beast is "unnecessary". It's the most commonly tossed around word when one is judging a remake of any kind, specifically when the original film is so acclaimed and cherished, and while I can't disagree in the sense that of course the film doesn't need to be made, my general opinion on the matter is, why not? I know, I know, less retreads, more original ideas. Celebrate bold and daring cinema rather than business as usual projects that are made with the goal of printing money. Here's the thing though, remakes and sequels are going to happen. They are a part of the cinematic landscape whether you like it or not, and while the concept of don't pay for a ticket and then studios will learn their lesson is accurate, in the words of Terence Mann from Field of Dreams, "People will come.". I walked into a nearly sold out IMAX screening of the new Beauty and the Beast, people crammed into the seats like sardines excited to experience a story they love told in a new way. The box office numbers this weekend will be astronomical because people want the familiar along with the new, they want the nostalgia pouring out of the words they know with a dash of original content to mix things up a bit. They want characters that they have loved since their childhood played by Hermione Granger and the dashing actor from Downton Abbey (although for me it's Legion and The Guest that make Dan Stevens a familiar face). When I say they, that includes me. Sure, I want more original cinema. I want more innovative storytelling and unique concepts and bold, memorable work. I also love the animated Beauty and the Beast and am more than willing to pay for a ticket to see if the magic translates to a live-action canvas, and while perhaps it has a bit of a pacing issue with some new content included that extends the length beyond the brisk, tight 80 minutes of the original, overall the good news is it does translate. The new Beauty and the Beast is a winner. 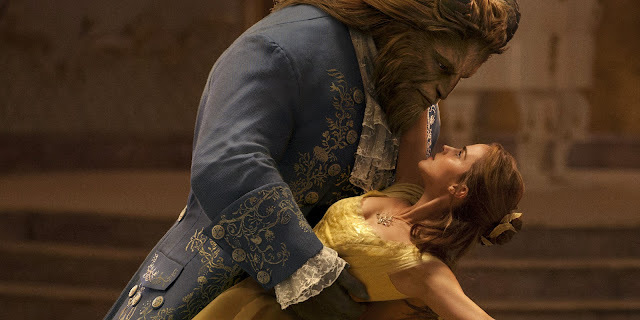 The single most important aspect to get it right was casting, specifically Belle because without the right beauty, no one would care about a beast. Emma Watson is perfect in the role with a look that glows and the essential touch to both charm and inspire empathy for Belle and her plight. To put it simply, if Watson was in the frame, that scene was better for it, and while it may prove hard to look away from her at times it's also mandatory in order to fully appreciate the artistry that went into the various elaborate set pieces and costumes, the way the castle is so perfectly lit to make one room inviting and the next ominous and unwelcoming. I previously mentioned Dan Stevens and he proved to be a good choice to play The Beast, while throughout a vast majority of the film you wouldn't know who was playing the role nor may you care to find out. Stevens' face was digitally imposed onto the Beast with motion capture technology so he is always playing the character, but what he is tasked with here doesn't inspire a level of praise that someone like Andy Serkis gets and deserves for his work in the new Planet of the Apes trilogy, although honestly it's not fair to hold anyone to those lofty heights and expect similar results. For what Stevens was asked to do here, he did it well. As for side characters, Luke Evans embodies everything that is needed out of a live-action Gaston, the good looks along with the smug arrogance that makes him so unlikable. Nevermind the absolutely absurd controversy surrounding the film and Josh Gad's take on LeFou, with a blink and you will miss it "gay moment" that honestly is so tame and run of the mill it actually makes me cringe a bit that this film was being praised in the other direction for having taking such a progressive stance by introducing an openly gay character because now having seen it, can we really call him openly gay? I expected a far more inclusive and heartwarming statement about love and equality, but I digress. I won't judge the film because of hype but rather what the film itself actually achieved, but I figured it was worth mentioning. The only actual issue with Gad's LeFou is that not every joke lands, especially early on in the film during his follow Gaston around and idolize him portion, but as the story unfolds his material feels less forced. Kevin Kline is solid as Belle's father Maurice, and Ewan McGregor, Ian McKellen, Emma Thompson, Gugu Mbatha-Raw, Stanley Tucci and Audra McDonald all do great vocal work as the various household items in the castle that are brought to life because of the curse. Perhaps it doesn't run as smoothly as the 1991 animated feature and of course since the material has already been done, this retelling was never going to feel as fresh as that once did, but it was easy for me to get lost in the songs I know and love, the intricate detail that went into crafting the village and the castle, the precise choreography that made big musical numbers feel joyous and effortless and the performances by a gifted ensemble, lead by a beauty that was born to play Belle. I was surprised how much I liked this film. The trailer had all negatives for me, but watching the film I really enjoyed the character designs, the acting, and most surprising of all I really enjoyed the added and new material planted in the film over the scenes that are taken right out of the animated classic.